I made a Tarte au Citron, Lemon Tart, to take to a France v Italy Potluck on the eve of the World Cup finals. 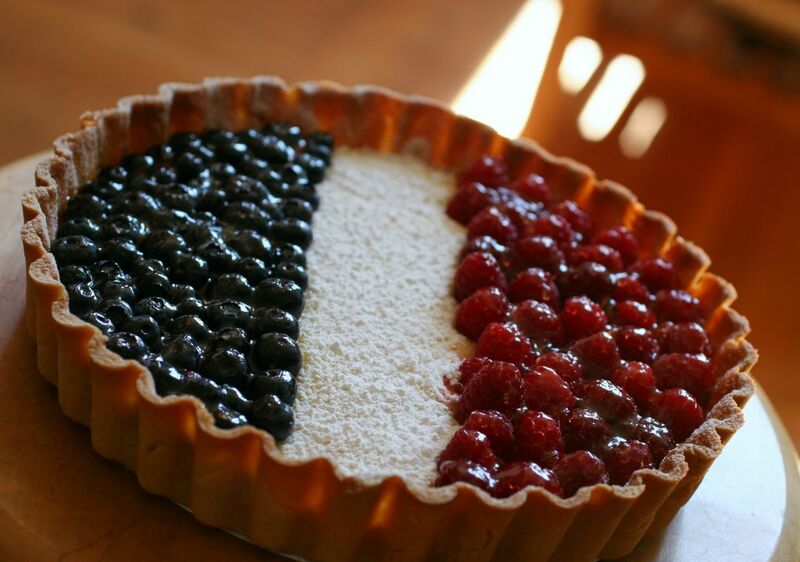 I topped it with blueberries and raspberries to look like the French flag. Bonne chance a France. Allez, allez, allez! PS. Check out the glaze on my tart. I used Paradise Jelly made by fellow blogger, Jen. You can check it out her Bakerina Kitchens. I really hope the cake will take its place on the table with pride:) Allez! Sorry Sam but I just have to say it (despite Berlusconi):FORZA ITALIA!!!!!! Thanks Sam, all the country will stop to breath at 21 pm. WOW! This is truly amazing! I hope this will bring luck to the French team! Voilà un bel hommage aux bleus! THANKS!!!! Ta tarte est très joli,et j'espère qu'elle portera chance aux bleus. It's a very nice idea! I can't tell you how cool it was to be in France on Wednesday when they clinched...we're throwing a little get together for the game...should be great! And yes, we're rooting for France!! The other team is most likely bringing a basilic-mozarella-fresh tomato pizza and the French pie wins that round handily. The Italian side made bruschetta, tomato basil spaghetti and melted onion pork chops plus potato gnocchi. The French side brought handmade Parisienne Gnocchi, the tarte au citron as pictured, duck liver mousse and beef bourginon. Gorgeous! I'll need an extra big piece so I get a little of everything, thanks! I think Zidane saw your tart and that was why he needed to get off the pitch so quickly. Clearly, he was hungry. I'm sorry about the result, very sad. Ah Sam, I was thinking of you throughout the game today, and the crowd at Café Bastille. Well at least you had a glorious tart! Your tart is lovely! I was rooting for France as well; Italy does too much diving on the field, in my opinion. I just saw the espn recap of the game after traveling all day. Drats! My condolences on the result. I went out this afternoon to get an iced tea from the coffee bar down the street, and as soon as I heard the crowd roar at the beer garden two blocks away, I just knew. Oh- but the crowd at the stadium- what a hoot! In the overtime: Every time France *touched* the ball- huge cheers. If Italy even glanced at it- boos and whistles. Shame Zidane didn't get a propper retirement send off tho. thanks for all the good wishes everyone, too bad the match was spoilt by the 8th deadly Zin. Anyway - if you are at all interested here is a link to a picture of Belden Alley and Cafe Bastille during the game from SFGate (I can't work out quite which pinhead is me). And I want to give a big shout out to Olivier of Cafe Bastille for being such a gracious host and providing a complimentary 4x3 meter screen even though he was unable to actually do any business because of the crowds. If I fell as easily as those Italians did everytime a French person bumped into me that lightly...I'd be in l'hopital 24/7. At least Zidane gave one of them really something to fall down about! Allez les bleus! Even though they lost (sniff) I love your cake it looks fab and I am sure it cheered everyone up on the french side at the party. Just a little note: Zidane's headbutt was the best thing considering what REALLY happened. I read in the papers today that the soccer commision got some lip readers to read what the Mattarazzi guy said to Zizou to make him react that way. It turns out he insulted Z's sister twice by calling her a very bad name (someone belonging to the oldest profession). My question remains: When is the re-match? What a wonderfully elegant way to show your support for Les Bleus? I'm sorry for the way the final turned out, but as long as your friends got a piece of this fabulous dessert I'm sure they went home happy! I also made a pro-France tart for the Brazil game. If ever we do well for the Euro, I'll try your version of a supporter's tart, it seems more elegant and summery-fresh than my chocolate caramel tart. Im not sure if you'll read this, but just wondering if you made that pie crust? And if you did, I was wondering whether you have any tips on how to prevent the crust from shrinking too much because I seem to always have that problem. Thanks.